BMW is flying high over its 7 Series, which was fully revealed Wednesday and goes on sale in the U.S. this fall, and the company seems bullish about its continued experiment with carbon fiber. The sixth-generation 7 Series in America will be 190 pounds lighter than the fifth iteration of the sedans thanks to the cars’ reliance on a carbon-fiber “Carbon Core,” aluminum and high-strength steel, BMW said Wednesday. Oddly, an international version of the news release puts the weight savings at 130 kilograms, which is more than 286 pounds. BMW spokesman Hector Arellano-Belloc said he couldn’t immediately explain the discrepancy, though he did specify that the weight described in the U.S. release referred to the 2016 750i xDrive. The 2016 740i will also be on sale in America. BMW said 370,000 cars in the previous generation were sold internationally between 2008 and today, with about 76,000 of those in the U.S., according to GoodCarBadCar. So while it’s not exactly the 3 Series, 7 Series vehicles aren’t concept cars either, and BMW certified repairers are more likely to see one or two in the coming years. Arellano-Belloc said he didn’t have details on repair procedures for the 7 Series other than that BMW’s typical network of certified dealerships and third-party shops would be able to work on it. However, he expected to have more insight shortly, so continue to check Repairer Driven News for details this week. BMW did release more information Wednesday about which parts are made out of which nontraditional material, spelling out some of what could be deduced from other media released by the company. That ought to give auto body shops at least some inkling into the different repair techniques that will be necessary. Carbon fiber can be found in the B- and C-pillars, rocker panels, roof bows and rails, transmission tunnel and rear deck of the 7 Series. In some cases, such as the B-pillar, it pairs with ultra-high-strength steel. BMW also said that the doors and trunk lid are aluminum for the first time on the 7 Series. 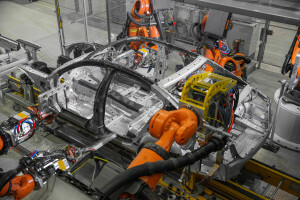 The company credited the wet pressing and hybrid pressing carbon-fiber techniques used by its Dingolfing, Germany, plant for helping make the production run possible. “Both processes enable highly economical large-scale production of up to several thousand carbon components per day, with compact systems engineering and short cycle times,” BMW said in a news release.